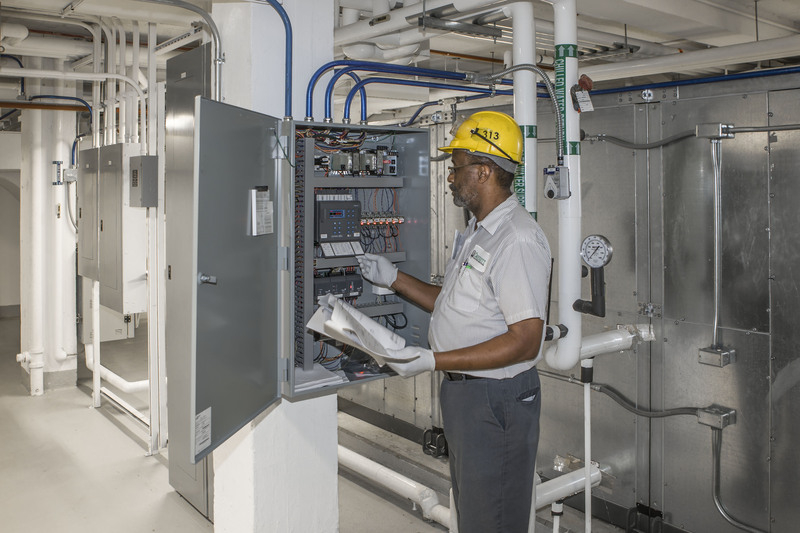 Our goal is to constantly identify and implement measures that reduce energy and improve the operating efficiency of mechanical and HVAC equipment in our customers’ commercial and government facilities. When buildings are not properly commissioned, operated or maintained, as much as 30% of the energy used is wasted. With our energy management services, your heating, ventilation and air conditioning (HVAC) systems will operate more efficiently, extending equipment life and lowering your energy costs. As a MSCA GreenSTAR certified contractor, we are a leader providing energy-efficient heating and air conditioning services and environmentally-responsible solutions to our commercial and government customers. We are part of the ENERGY STAR Small Business Network, committed to using environmentally-friendly products and helping our clients achieve their energy-saving goals. We use the EPA’s Energy STAR Portfolio Manager to track and manage energy usage and to benchmark buildings. We can provide our customers with information about how their buildings are performing relative to similar buildings and calculate their ENERGY STAR scores, helping them implement energy conservation measures and raise their ENERGY STAR scores. Our approach to energy conservation focuses on equipment operation practices and HVAC preventive maintenance. We evaluate the operating performance of centrifugal chillers, cooling tower, air handling systems, motors and boilers and implement energy-saving measures. We look for retrofit opportunities to conserve water, reduce energy usage and make facilities more efficient. We can conduct energy audits for our customers, encompassing heating and cooling, water, building envelope, water lighting and office equipment. We analyze customers’ utility bills and data related to energy usage, summarizing our findings with recommendations for energy conservation measures and estimated cost savings. In addition, we evaluate the performance of our customers’ Energy Management Control Systems (EMCS) and Building Automation Systems (BAS) to identify and implement both operational improvements and energy efficiency measures. We re-tune sensor and actuator calibration, HVAC scheduling and temperature/pressure set points to obtain maximum system efficiency. Daily tours in a building represent another way that we identify potential energy savings for our customers. During the tours, our engineers look closely at each piece of equipment to ensure that everything is connected and functioning, properly. When we replace or repair equipment, we seek out alternative energy efficient options. When making changes in the daily operations of our buildings, we use a Systems Thinking approach. We evaluate the changes we are making and how they will affect other building operating systems. What may have been acceptable in the past may not be acceptable now. We are constantly identifying new ways to help our customers improve their ROI and to operate their buildings at peak efficiency. Our MSCA GreenSTAR qualified service technicians improve HVAC performance and energy efficiency to save you money.